Openly Straight is a wonderfully fresh twist on stories about gay teens. Rafe is a regular Boulder, Colorado teen who likes soccer, skiing, and writing. As openly gay, his parents are so accepting and supportive, it’s almost like they enjoy his “gay” label more than he does. And for Rafe, that is exhausting. He wants more than living through high school as just a label. Rate wants a new start, away from labels, and decides to transfer to an all-boys’ boarding school across the country. He makes the decision to not tell anyone at his new school that he is gay. He doesn’t mean to go back “into the closet,” but doesn’t want his sexuality to define him. He doesn’t plan to lie unless directly asked if he’s gay, he just wants to fit in and be free to have friendships that don’t revolve around his sexuality. While I love that Rafe wants to be his own person, I like that Openly Straight explores the question of Rafe hiding who he really is. After quickly becoming part of the jock crowd at his new school, Rafe realizes it’s harder to hide who he really is than he thought it would be. I think a lot of teens wrestle with the idea of exposing themselves, whether it’s their sexuality or just their true quirky personality. Rafe is a great example of a teen who has big stakes and wrestles with the choices he makes. Rafe actively decides his future. He chooses what is important to him and works to make that happen. While I didn’t always agree with those choices, I liked that Rafe didn’t just accept things as they were. 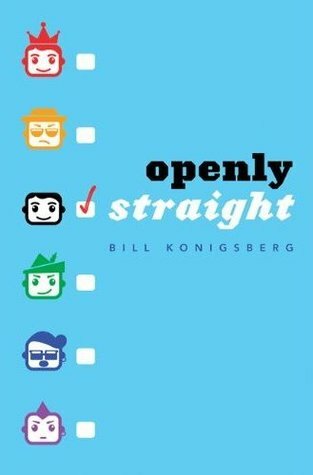 Openly Straight is a great story because it shows it’s more important to be true to yourself than to look for acceptance from others. And that is a message for everyone. Straight to my TBR list! That is great to hear! I'd also recommend checking out his other books, too.